Etsy connects crafts people with potential buyers. Originally intended to be a marketplace for hand-made goods, Etsy has grown to include a more varied set of merchants: small-scale crafts people (lower volume/home operation), larger scale (may also sell goods in retail shops) and purveyors of vintage goods. The base site is English/US but there are also French and German versions of the blog. The design has a hip, youthful, feminine vibe; the homepage is clean, with links to different categories and shops. The design allows easy filtering by three category types (handmade, vintage, supplies) and scanning by product category (accessories through woodworking). There is a search box. The audience appears to be artsy women in their late 20s to early 40s. Generate revenue through listing fees and sales commissions. Etsy stats from press kit. There is no “connect with us” page but there is a social media panel on the blog and links on the contact page. 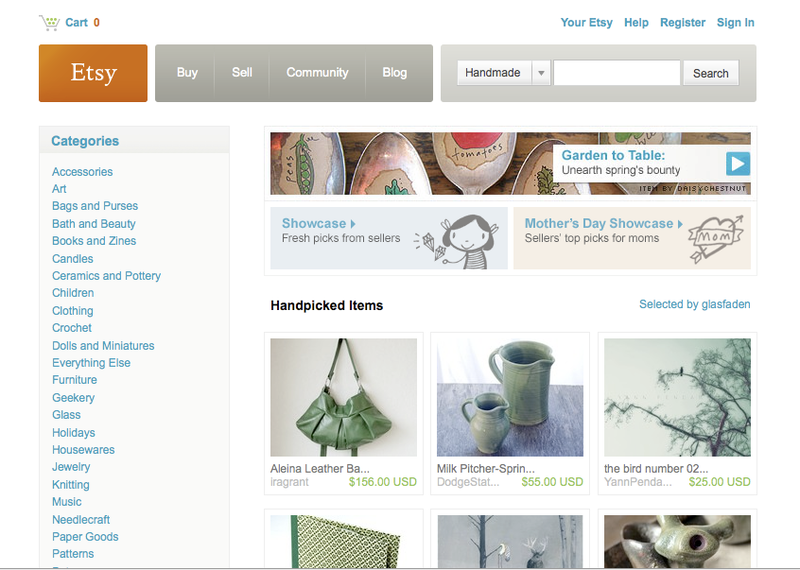 Etsy features its social media links on its blog. Web site has a WordPress blog (view source) and RSS for the blog; there is a shopping cart; the site uses PHP and has an open API (according to their developer section).